I was asked to shoot a music video with London based rapper Stevie P & Sketch from E4's Tattoo Fixers. Shot on a cold and foggy December evening, this was my first ever attempt at a music video and I had no real concept for the shoot only that I knew what locations I wanted to shoot it at. If I'm honest I well pleased with how it came out, and despite rushing the editing to get the video out on a deadline date, I think there would only be a few changes I would now make, so maybe a directors cut - Take II - will be on the cards one day when I feel the inspiration. For now sit back and enjoy the video. Sundays are sometimes not the most exciting days when there is little or nothing to do. It's the time of year when the nights are drawing in early so I decided to venture out to Canary Wharf and frequent a few familiar places I'd visited previously with my Nikon and do some night photography, only this time with the Olympus EM10 mkI. I only took one lens with me with that being the 12-40mm pro, giving an equivalent of 24-80mm. I'll point out that 24mm is not a lens to do this kind of shoot with as it is simply not wide enough for those tall buildings and they just don't fit in the frame when lens corrected, so choosing the right place where to photograph from was key. I think I need to make clear that the evening was not good weather wise with very high winds, rain and overcast low cloud that would make you wonder why I even bothered to go in the first place! I also took along with me my smallest tripod for two good reasons, the first being portability along with it's very light weight I needed it to fit in my small Manfroto shoulder bag. The Velbon CX Mini, a tripod I usually only use for still interior video, fitted perfectly. The second reason I needed a small tripod was that photographing around Canary Wharf requires a permit, so I needed to look as inconspicuous as possible and carrying a large tripod about would have had the opposite effect. Just a side note: I have obtained two permits in the past and photographed freely with my Nikon, but that doesn't guarantee you not getting stopped by security. For this shoot I wanted to shoot 3 prime locations that I know produce good photographs so I started out my night at Cross Harbour, a wide open space of water that is also known as Millwall Inner Docks that looks towards Canary Wharf. To the left are retail and offices and to the right is The Floating Lotus Chinese restaurant and more retail outlets further down with South Quay DLR at the end. Notable visible buildings are Citi Bank, One Canary Wharf and the beautifully coloured Pan Peninsula building. There are a few notable spots worth photographing from this location, with one being rather risky and definitely not advisable with weather as bad as it was. Sadly after only about 20 minutes the wind was so strong it was becoming nigh impossible to shoot, and despite my tripod being cheap and small it was holding its ground extremely well, just I wasn't! And it was shortly after this I had to abandon and take cover and head inside Canary Wharf until the rain eased off. The third and forth locations are split as two parts although they're technically almost the same shot just from different places. The first being a covered walkway leading from Columbus Courtyard to Hibbert Gate. This location has a lot of security cameras, but there are pockets that overlook the North Dock and its from here you can get some good shots. I was once stopped by security in this very location a few years prior, but luckily on that occasion I was finished and was almost packed up as he explained I wasn't allowed to take photographs. So it wasn't long after I'd grabbed a few shots that I heard footsteps and gingerly looked behind to see a guard walk by. Had I had my big tripod with me he would have most certainly have seen it and stopped me, but with my tiny tripod and the EM10's small size I was able to shield both behind my legs making out I was just admiring the view and he disappeared. It was time to move on as the security cameras would have most certainly spotted me entering the walkway and disappearing into one of the pockets without reappearing, and probably as to why they sent a guard out to investigate. The fourth and final location was next to St Peters barge looking down the walkway that has the impressive Marriot Hotel to the left, One Cabot Square to the right with West India Quay DLR and bridge at the far end. I personally like this location if only for the Marriot Hotel. I moved from side to side for about 15 minutes before the rain once again came in and I decided enough was enough and I called it a night, but not before getting totally soaked making my way to the DLR station as the rain was now hammering down. Below are a few Samples from the nights shoot. Having ventured up The Shard earlier in the year I was getting a vibe for these high rise shoots! As I m mentioned in a prior blog, The Shard is an expensive venture at £25 to visit it's 68th and 72nd floor viewing platforms, whereas the Sky Garden is FREE, but it is only half its height with its viewing platform on the 35th floor. So the question is : Does it live up to its Bigger Brother across the Thames? Absolutely it does! The Shard in my opinion only has three good views, with the south view being its weakest as there is nothing of interest to see or photograph, and if anything (spoiler!) the best view from The Shard I think is the unrestricted view from the toilets! I think if the entry price was £10 then I would probably venture up The Shard a few times a year, but at £25 I'll probably never go there again, I just refuse to pay another one of London's silly admission fees. Once you enter the 'Walkie Talkie' you first have to go through what seems like airport security, obviously for your own personal safety, so photo IDs, trays for your entire belonging you happened to bring with you as well as a body scan are first required and then it's straight into the high speed lift that takes you up to floor 35. Despite it being only half the height it has 4 amazing views. The south view looking at Shard is the only 'technically' outside view, although you are still looking through a glass panel and a have part covering overhead. I think you'll still get soaked if it rained and I'd imagine on a cold day you'll freeze admiring the amazing view. From the West you'll look up river at St. Paul's, The London Eye, The Post Office Tower and Wembley's Arch. With the South view being undoubtedly the best view, it is quite unrestricted. The East and West views however are a little strange as there is a handrail that runs the length of the interior of the building, and in my opinion this is too far away from the window I had to dive underneath to get closer to get a photo, but I guess it wasn't designed in mind for photographers and I doubt security would like everyone to do as I did! The North interior view is based around a large open space that I can only guess where they hold main functions in, if not it seems a rather large waste of space. There are a few potted trees and a large wooden bench that runs the width of the room, but again I found it way to far from the window. Being a photographer obviously I have to get that shot so I stood on the bench with this had a knock on effect with those around me also looking for that great shot so also they stood on the bench after I had dared to do it! But I have to say it is a very impressive view, and I am torn between which is best North or South. To sum up: The 2 hours spent in the Sky Garden I can definitely say was worth it from a photographers stand point and more I'd say the visiting The Shard and not just because they want a £25 admission fee but due to the Sky Gardens four amazing views. This is not really a tutorial on editing, it's more just a very fast example of what I do to certain photographs in both Lightroom and Photoshop. This editing was an 8-10min screencast I did on a photograph I took at London's Canary Wharf. It's not in anyway a final version as I tend to refine photographs for at least an hour or more. So sit back and enjoy a fast lane edit with some great music supplied by Rameses B. Make sure you hit full screen for full HD. This is probably the shortest of my blog entries! So you have the latest camera, you got yourself some top of the range lenses, you buy yourself a flash, tripod, and filters. You are now one of the fully fledged photographers... Or are you? I see it like this, and seeing being the key feature. If you can't look at a subject and see the photograph without putting the camera to your eye, then no amount of photography gear will make you a photographer, it's as simple as that! Apologies if I crushed a few dreams. Since I started out in photography I've always been fascinated by London architecture, although if you read my blog my love for London photography is usually when it is dark. Before I start I would like to point out that anyone reading this and planning a visit should note that this article contains a big spoiler along with photographs of it, if like me you like surprises, then it is best you not read the very last part of this piece. As the Shard was being built, I photographed it in it's many constructional stages, though most not worth sharing... Who wants to see a photograph of a concrete lift spine? But saying that though, once it was 90% finished with just a small crane at the top I did share quite a few photographs taken from Tower Bridge and also The Scoop. When The Shard opened on 1st February 2013, you think as a photographer that I'd be the first in the queue to get to the top and photograph the London I love from such an amazing height. Sadly that was so further from the truth! They wanted £25 to basically look out of a window, OK granted it is not any old window, this window is 802ft above the ground. But £25!? I just couldn't pay such a ridiculous admission fee. So why the change of mind?... It wasn't me... It was the wife's idea! Arriving at about 10am, an hour earlier than our ticket time, we managed to get in half hour early due to it not being very busy and after going through what seemed like airport security, we entered the lifts that incidentally travel at 6mtrs per second! And after two lift journeys we arrived at the viewing platform on level 68. The 'Viewing Platforms / 'Viewing Galleries' are located on levels 68, 69 and 72, these 'viewing spaces' are just basically open areas around the central lift shaft with glass windows surrounding all four sides facing north, south, east and west. From a photographers stand point, the south is probably the least interesting view. This is in my opinion the best view, from here you will be able to see the River Thames, HMS Belfast, Tower Bridge', 'The Walkie Talkie' on 20 Fenchurch Street, 'The Cheese Grater' on 122 Leadenhall Street, 'Tower 42' formally known as the 'Natwest Tower' on 25 Old Broad Street, 'Heron Tower' on 110 Bishopsgate and 'The Gherkin' on 30 St Mary Axe just to name a few, with all these apparently have bars or dining areas at the near tops of their buildings. From here you can see the London Eye, St. Paul's Cathedral, Southwalk Cathedral, Borough Market, The Millennium Bridge, The OXO Tower, The Tate Modern, Cannon Street, Blackfriars and Charing Cross Stations and more. The view from the east is almost as impressive as that of the north. Views from here are best if, as a photographer, you want that shot looking up the Thames towards Canary Wharf. From this side of the Shard you will see Tower Bridge, The Scoop, The Tower Of London, City Hall, More London and Canary Wharf and more. Just some information about this photograph. The main composition of this shot was to show the River Thames as it winds up river towards the sea, as well as to capture as many of the important points of interest I could get. Finally the view to the South is for me the least interesting with the only recognisable building I could see was The Strata Tower. On this visit to The Shard I also took my newly acquired Olympus OM-D M10. This was the first test that I'd put this camera through, and although for serious photography I will always use my Nikon, on this occasion I wanted to see what overall image quality was produced. With the camera being a 'Micro Four Thirds' and only 16mpx it was never going to live up in terms of quality and sharpness to its Nikon big bother, having said that the image quality was rather impressive. I will say shooting through some seriously thick glass did have an impact on both cameras in terms of final image quality. 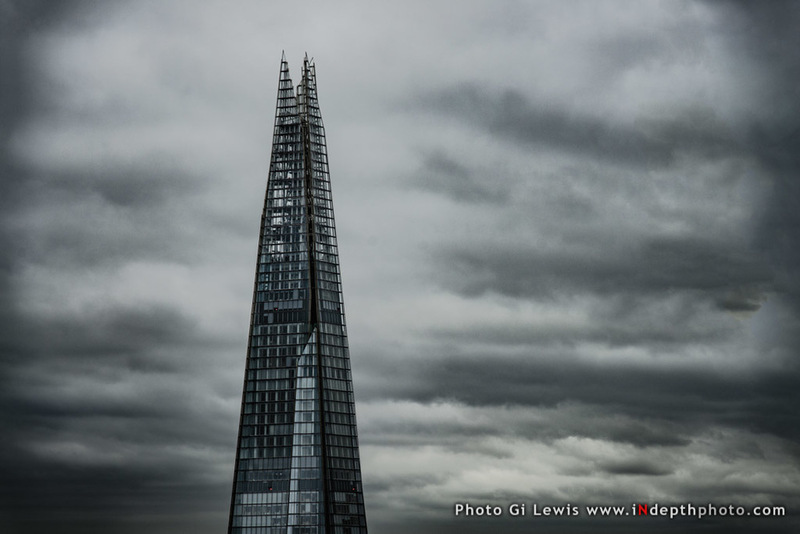 Whilst from a photographer and viewers stand point, I enjoyed The Shard and it's stunning views across the city of London, but I can't help feel that for the value for money aspect this attraction in my view is just not worth the money. If it was priced at £10 then I probably have been up there 3 or 4 times by now, but because of it's crazy overpriced admission fee of £25 or even higher at £30 if you just turn up. This latter price being just plain ridiculous! I feel it's these stupidly priced attractions I believe kill London, and probably why we were allowed in 1/2 hour earlier as now once the hype is now over then the emptiness will slowly begin. 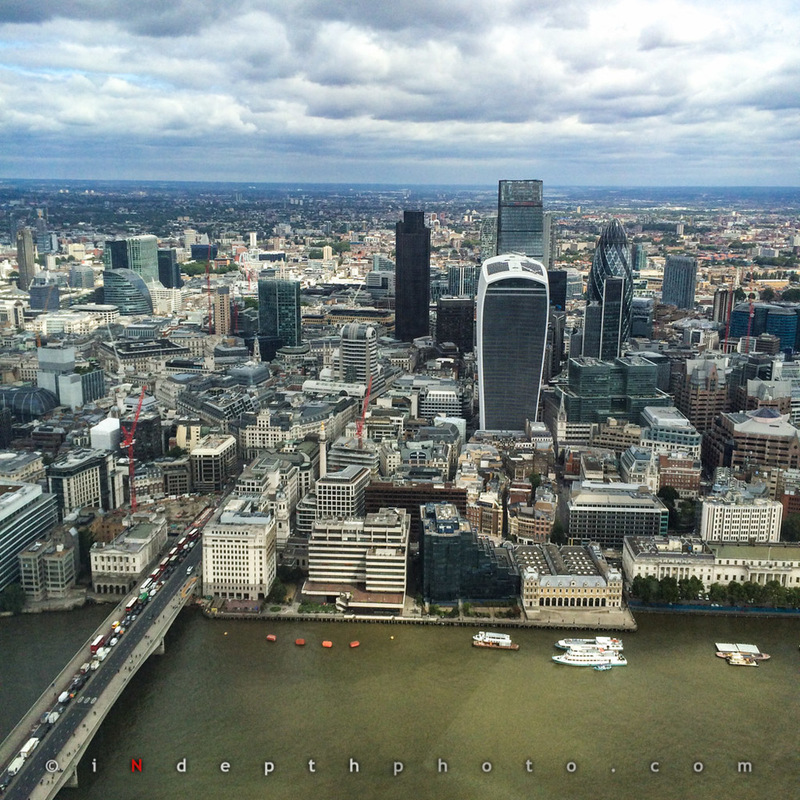 My Next visit will be to the building opposite - "The Walkie Talkie" Sky Garden. And it's admission price? FREE! - Take note Shard! One of the best views I personally believe you can get from the shard is from the toilets! 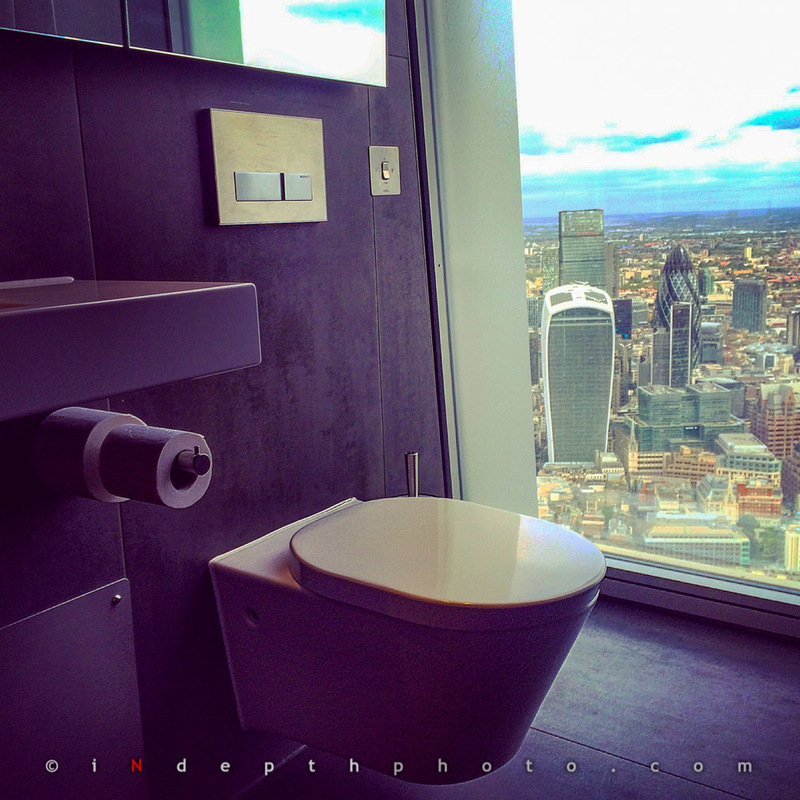 Picture a toilet that is 800 ft up and placed next to a large floor to ceiling window giving you one of the most impressive views of London! From here you look out over the north view without jostling for space with other visitors, along with not having the design of exterior obstructions (other glass panels) restricting the view. My wife sings in one of Britain's largest choirs "Rock Choir", and whilst prior to my obsession with photography, at the ripe old age of 20 I myself was obsessed with music, I had a track played on London's Kiss FM, a record signing that never happened, a self taught guitar player and lead singer in an alternative band that gigged about London that made 2 albums. Sadly that passion is now in the past, although I still sing and write music if only to myself! To start with I'd like to point out that I wasn't invited to photograph this event, and I, like many others who had wives, husbands or friends in the choir went along to see them perform, oh and grab a few images of the day! I guess I found myself focusing my images on the choir leader Michael, as he happened to be right in front of me, there was quite a turn out so space around the edge was limited and once I had picked my spot I was stuck with it. Michael has a way with his hands that seem to do 40 things at once to get the choir to do what he wants, although this way of direction really wouldn't come across in any photo and only in video, so to see what I mean you'll have to YouTube. I personally thought that just capturing the choir on their own wouldn't come across right, and look like snapshots, this was due to my positioning and had I been placed more to my left I probably would have got more of Michael and the choir. Certain song performances also had lead vocalists, of which I also wanted to capture. I sadly missed one male singer due to myself trying to be clever and capture some video of that performance but that ultimately went wrong, and whilst fumbling to get back to my camera, he had left the front as it was only a short intro that he was singing. I guess the moral of this story is to stick to what I set out to do and that being to photograph and not to do video! I guess my favourite shot of the day is the first image below, and whilst it is technically the back of Michaels head, certain images not only show, but also tell a story to whoever is viewing that image. More of my images of this day are in a gallery on the Rock Choir website. Eleanor contacted me about a shoot but was unable to do the day I was casting for. I liked her look so much that I moved my day to photograph her. There are some models you just click with (no pun) and I got so many "keeper" shots, more than any other model shoot I'd photographed in the past. So when she dyed it back to black along with a pixie cut I just had to book her again for another shoot. For me personally, this is probably my most favourite headshot I've ever taken.